In a small bowl whisk tighter the ground flaxseed and water. Let sit to form a “flax egg”. In a separate small bowl whisk together the almond milk and apple cider vinegar to create a “buttermilk”. Let sit. Preheat oven to 350 degrees. 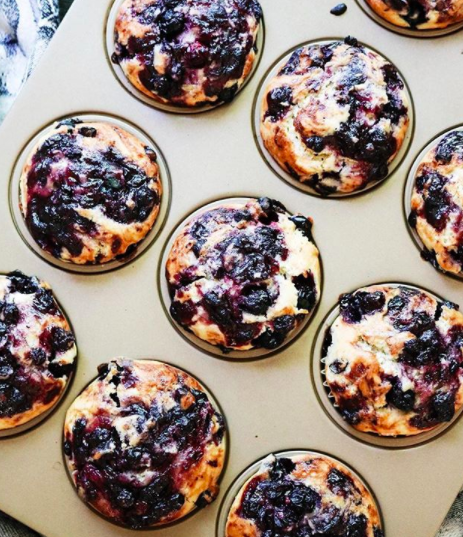 Line a standard muffin tin with non stick muffin liners. Whisk sugar, flax eggs, and both oils together in medium bowl until combined. Add the almond milk “buttermilk” and vanilla until combined. Fold the dry mixture into wet mixture, along with fresh blueberries until just moistened, careful not to over mix. Divide batter equally among prepared muffin cups (batter should completely fill cups and mound slightly). Spoon teaspoon of blueberry jam into center of each muffin. Using a toothpick gently swirl berry filling into batter using figure-eight motion. Sprinkle with a little sugar over top each muffin (optional). Bake for 17 to 19 minutes. Cool muffins in muffin tin for 5 minutes, then transfer to wire rack to cool.